Flamingo closed in mid-2015 and the building is now home to Republika. I always get annoyed when I spend a long time living in a city and only discover cafes and restaurants that I like years later. Especially when I’ve been meaning to go to them for ages! Flamingo Chinese Restaurant is one of these little gems. Located in Kimihurura just down the road from Africa Bite, it’s central and their balcony has a pretty fantastic view back over to Kiyovu. They’re one of these places that close for a few hours in the afternoon from 3pm to 6pm so make sure to sneak in there before they close the doors in he afternoon. We didn’t realise they had the break in their day and accidentally snuck in just before 3pm and stuck around until at least 4pm. The service was still friendly and there were actually a couple of large tables with big orders that seemed like they’d be sticking around for awhile. Service-wise, everything was great except for when I had to ask twice for a cup to share a pot of green tea. But he was working on his own, we were there when they were supposed to be closed, and he was also looking after other tables, including one large table of people so I can’t complain too much. Really great service without being too overbearing. Our food came pretty fast, but not so fast that you wondered about its freshness. The veggie spring rolls (Rwf 500 each) came with some yummy sauces. They weren’t really that fat and stuffed with veggies, more long and thin and crispy. I liked them, my friend didn’t as much… she prefers her spring rolls with more thick and less crisp. So there you have it. We ordered the sweet and sour pork (Rwf 4,500) and chicken with cashew nuts (Rwf 6,000). I loved the pork dish… nice big chunks of pineapple and the pork was really tender and delicious. Flamingo proudly state on their menu that they don’t add any colouring to their food and it shows in this dish which, I guess, is naturally brown. Have the same dish at Great Wall and it’s nuclear orange. Not sure what goes into food to make it that colour but, while I like the sweet and sour pork at both places, it is slightly alarming to see that it practically glows at one restaurant and not the other. I liked the chicken and cashew dish less but it was still really good. Big pieces of chicken and green peppers and a nice sauce. I thought the chicken was a little chewy which is the only reason I didn’t really love it. The green tea (Rwf 1,000) was good and came in a seemingly endless pot. They also offered to heat it up. 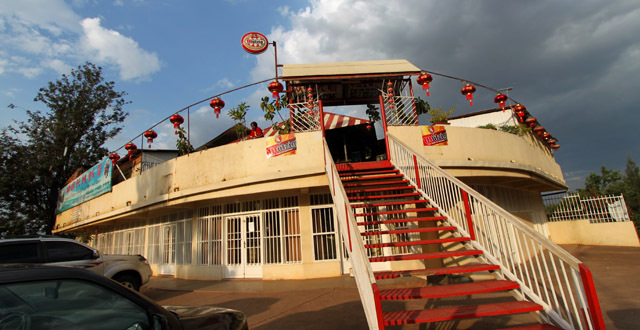 The menu is pretty vast and includes soups (chicken wonton soup is 2,700), dumplings (they were out when we were there but range in price from 4,000 to 5,000 depending on fillings), the usual fried rice and noodle dishes, and sizzlers (Rwf 4,000 for veggies up to Rwf 13,500 for prawn and everything in between). Our total bill came to around Rwf 15,000 but we had plenty of food leftover to take away. The wine menu includes bottles which is a nice break from boxed Drostdy-Hof wines (although you can get a glass for Rwf 3,000) and range in price from Rwf 20,000 to Rwf 65,000 for you fancy folks out there. A small Primus is Rwf 1,000 and cocktails range in price from Rwf 3,500 to Rwf 8,000. They’ve got a good selection of desserts as well for around Rwf 3,000. They’ll also do whole roasted ducks forRwf 22,500 which, I was told, would feed four people. Then as I walked away I was told five, and then six! So who really knows. 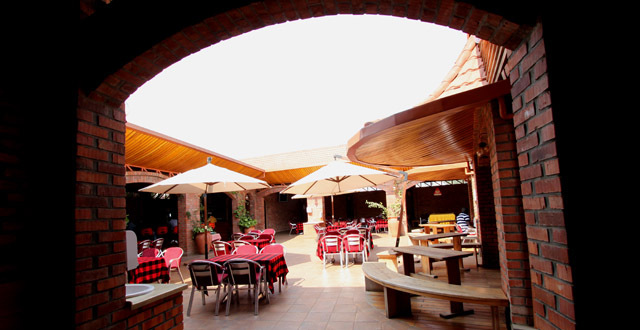 But it seems like it’d be a nice night out with some good food you can’t really get elsewhere in Kigali. I really liked this place and was happy to be given a menu before we left and told that they deliver! For takeaway call either 0788 302 437 or 0784 609 695. Delivery costs Rwf 1,500 to Kiyovu but we didn’t ask about other areas because we’re mean and only care about ourselves. Thank you very much Kristy for your review. I have highlighted your review on our Facebook page. Now Thomas thanks for the support and thanks for letting me know about the update on the Facebook page. We give very high value to such reviews and customer opinion in general, if there is any opinion suggestion and (we will try our level best that you wont have any) complaints let us know on our Facebook Page, email or on our phone numbers listed here. I love Flamingo. The service is good and vegetable spring rolls are amazing! The sizzling goat is always a hit. The jasmine tea is served is a huge pot that can be rehated. Would definitely recommend it. I like this place, the place look nice at night, however I would recommend the owners to pep it up a bit during the day time. Food is good, I recommend the prawn sizzlers and the pork sweet and sour “special”. The waiters are nice and friendly, they make me feel at home each time am there. Its one of those places that gets you hooked. Flamingo is amazing! Love it more each time! We had a very bad recent experience with Flamingo. We ordered take away after finding their menu on their Facebook page (their website seems to be down). When the food arrived we were shocked to find that the bill was significantly more than we were expecting (nearly double). 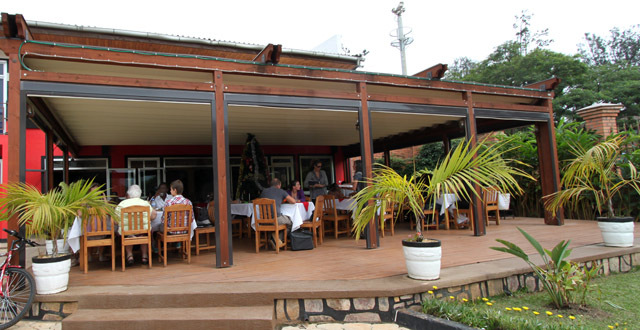 For example, a fish dish we ordered was 4,500 Rwf on their menu but we were charged 7,500. When we called to complain we were told they had raised their prices recently but neglected to update the menu on their Facebook page. We were offered a 10% reduction on our next order but this would have still left us significantly out of pocket and we didn’t really feel like ordering from them again after that experience. When I said I didn’t want to accept that I was told by the manager that he would call me back with a different offer, but he never did. And he didn’t respond to further attempts by me to get in touch. This is really disappointing customer service and left a really bad taste. We won’t be going back to Flamingo and will tell everyone we know that they shouldn’t either. Kigali folk should be aware of their prices changes and their attitude to customers. I am very sorry to hear that you have had a bad experience with us. We have had to increase the prices due to the reason, that the price of most of our raw materials have Increased. The menu on Facebook was outdated again it was our mistake, it has been removed. I sincerely apologize for the inconvenience caused. Please do not stop coming to Flamingo, we do value your business and what happened was a mistake from our side. Do give us a second chance. The change in pricing is not in our control as most materials including Rice, Fish and other materials have had a significant price increase. I also apologize on behalf of the manager for not calling you back. Call me on 0788300369 next time you want to place a take away so that I can ensure that you get a 30% Discount on that bill. I’ve only ever been here for work events where we’ve pre ordered so I can’t say anything in terms of timing etc but the food has always been very tasty and the service really lovely. They may be a bit more expensive than other places but I think because of the quality and the portion sizes the prices are fair. It’s a lovely place to eat in the evening, nice view, lighting etc.